This is where you see all of the history for a single athlete that you, an athlete, or another coach/professional has entered into the system. To view an athlete's history at any time, select the "Athlete History" icon on the Home Page (as shown above). Additionally, when you enter a new event for an athlete and select Save and Close you will be taken directly to the Athlete History Page. This shows you the new entry that you have added, as well as all of the past entries by each specific form/event for that particular athlete. Mouse over the athlete and then click on an image, or the athlete's name to be taken to their history. The Recent Entries is automatically displayed to show all of the recent information that has been entered by or for that athlete. To view the history for a specific event/field, click on the drop down box as shown in the step below. To view other information that has been entered for this athlete, click on the drop down box beside "History to View" (as shown in the image above) and click on the form that you want to view. If there is any information stored for that event/form it will be displayed. The History Page shows all of the information entered by Form/Event (e.g. by Injury, Daily Review etc). The image above shows the history for the 3km Event Form. The coloured performance backgrounds are shown automatically, and any information which the administrator wanted to show as a graph is displayed in graph format (as shown in the image). You can rapidly see where the performance information is trending. 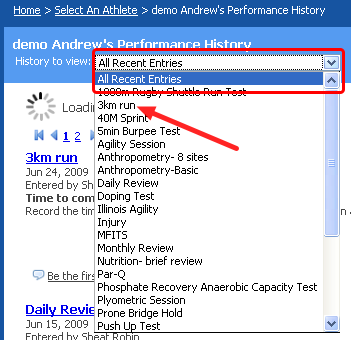 From the Athlete History Page just click in a cell from a row in the History table. For this example we clicked on the 3km Event entered on the 24-06-09. The actual Event Entry form loads in a separate page (as shown in the image in this section). You can see all of the original information. You may have access to Edit this page, but remember that any changes you make will need to be saved. -You may have access to edit this information. Simply change the information directly on this page and select "Save and Close" to re-save the new information. -You may have access to create a .pdf document of this event by selecting "PDF", naming the file and creating a report. -You may have access to Delete the entire event from the system. DO NOT DELETE ANY of your information as it is needed to have an accurate and complete review of all information entered by athletes. If you want to remove any entry talk to your coach/administrator first. #2 Click on the trail bar link (highlighted in the image above). You will be asked "Are you sure you want to lose all changes?". -Click OK if you haven't made any changes to the form and want to return to the History page. -Click Cancel to stay on the Page so that you can edit the form, and then once you have select "Save and Close". 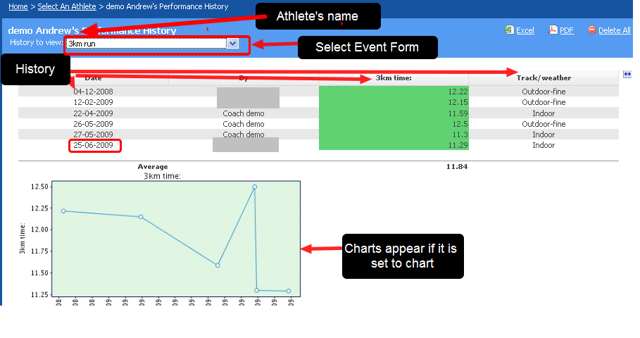 You will be returned to the Athlete History page and your changes to the form will be shown in the History. #1: Send the Athlete a message that goes to their mobile phone or e-mail account. #2 View their Profile information in case you need to find out any emergency information. 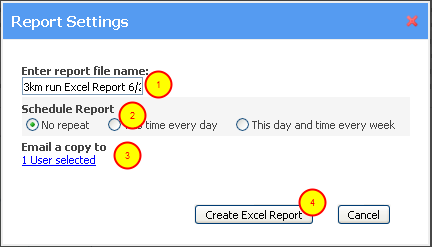 #4 Compare their data to different Performance Standards that have been sent up for that specific form (click on the drop down and select a different one). #4 Click to create the Report. It will run and be available on your downloads list.